My Quilting Christmas Wishlist - giveaway too! Last night, my dearest husband was asking me what I'd like for Christmas. I told him to go to a quilting shop and find things there. Kind of like me when he starts to talk about some kind of hockey play. LOL. So, in honour of my dear husband, spouses, family members around the world. 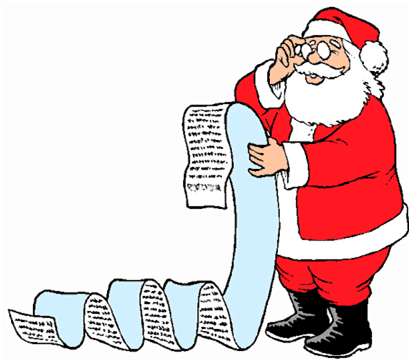 Let's make a list of desired crafty/sewing/quilting items that we would love to have under our tree. Tools, accessories, fabrics, threads, organizers.... I'm going to state the obvious - yes, we'd all desire a new machine, let's get that out of the way! I'll keep this open until Tuesday evening, December 1. I will compile a wishlist for you of all of the suggestions, and post it on my blog, by Wednesday or Thursday. I have no clue how big or little this may turn out. Please come back and see what others are wishing for. Perhaps there are some ideas that you hadn't thought of. Trust me, your family and friends will love you for this! **If you have links or websites, please include them. I'll link them in my final list compilation. Any suggestions, please email me! I'd be happy to hear from you! Now go. Get to it. 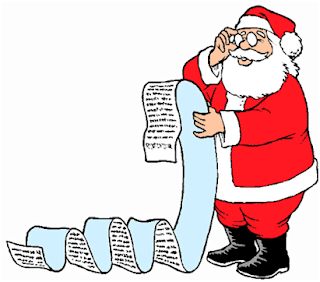 Make your lists and check them twice! Andrea's going to giveaway to someone who's really really nice! *giveaway you ask? yes...something nice. Perhaps a few fq's. Haven't decided yet. In Canada we have Winners and HomeSense. I think in the US, your related stores are called TJMaxx and Homesense/HomeGoods. Go to the stationary/books department, and scour the shelves. There's unbelievable deals there. Look what I found! I was so surprised to find these at this store. They also had beautiful knitting books and kits. This sewing kit was only $5.99 ! The Cath Kidston items reminded me so much of Amy. And then when I was 'thinking' of picking it up, the music in the store played the song she used to have on her music player on her blog "She is Love". Oh my gosh, if that wasn't a sign for me to pick it up for her, I don't know what was! So, I sent her one. They also had a kitchen list magnet pad, and a home decor organizer/planner in the Cath Kidston line. So cute! I also found this Amy Butler Sew-It Kit for $6.99. It came with two fabric pieces and a ton of patterns, as well as a sewing guide. Such a cute gift for that price! But it's MINE! All MINE!! My quilt top is finished, finally. Does anyone quilt like this? Turn light on to sewing machine.. Sit back down. Sew a seam, a partial seam. Mom, can you help me with this part of the game? Cat is trying to get under, er, rearranging my layout. Forget to put iron on. Wait for it to heat up. Iron is on auto shut off mode now. need to wiggle it to heat up again. Go check clock. Shoot - we need to run and pick up big guy from school! Turn iron off. Machine off. So...my sewing goes in snips and snippets. But, it's my life, and one day, I'm sure, I'll be wishing for the little ones 'needing' me all the time. Next, need to quilt it together, and deciding on a binding colour. Red? Green? Dots? I'm really happy with my sewing skills and how it turned out. Quite proud of the way the collar turned out and everything. But it just doesn't look good on me. If I had a professional fitter, perhaps to give it more shape or something. Perhaps (well, I know for sure) my body just doesn't look good lately, and this doesn't flatter me. It's boring. I do have a backup outfit to wear. I had a wonderful pity party with myself last night, after working all weekend on the thing. Beating myself up over the fact that I used up all of that time and nothing to really show for it. Anyone need embroidered taffeta? So, it's confirmed. I do not like sewing garments. At all. The cost of clothing is well worth the price, and the time consumed constructing a garment. I think in the back of my head I knew this project wouldn't work. But I plowed through anyways. I guess I wanted to see if branching out from quilting may be something to explore again - I used to love sewing clothes as a teenager. Not anymore. I love those cute bags that everyone makes, but I'm a solid colour leather/pleather kind of girl. Back to quilts. In other news - if you have PAX tires on your vehicle or plan to get a vehicle with PAX tires. Don't. What a load of crap. Three sets of pax tires now on my 07 minivan. With only 60,000 miles. They only last about 20,000 miles! Question - while at my LQS the other day I was perusing flannel. I asked the difference about flannel there vs my other fabric store that sells flannelette in those cute kid patterns. I got the eye roll and lecture about quality and pilling. Is this true? Truth be told, in my Christmas quilt (pics soon!) I used a combo of LQS prints and big store prints and could tell a difference in the hand of the fabric, the density of the weave, and the slight stretch in the cheaper quality stuff. So I was just wondering if anyone had experiences, good or bad with flannel vs flannelette. *sigh* I need to lose weight. This insulin thing has made me gain weight back quite rapidly over 6 months. My "move to Edmonton" weightloss was not really weightloss, but me being very sick, and now that I'm getting healthy again, so is the scale. :( Feeling very upset and low self esteem about it lately. Anyone know how to get out of the funk? oh yeah. my treadmill. Everyone...please welcome my newest family member, Suki. I adopted her from my neighbouring province, and she's beautiful. She found me through the Juki Yahoogroups....someone couldn't use her anymore and went on to bigger and better machines. The owner thought I may be interested, since I posted my interest in purchasing new locally and couldn't find a Juki dealer. Suki arrived here at 9:30 am. It of course is a story in itself. It's a week off for the kids, so we've been slow on getting ready in the morning. Naked in all my glory, about to step into the shower, the doorbell rings. All I hear are the stomps of the rush of two boys feet (with only underwear on) on the hardwood and the clicking of the dog's nails...and the announcement barking. The stampede to the door. I'm upstairs shouting DON"T OPEN IT!!!! I"M NAKED!!!!! Panicking...of course, because anyone coming to the door is a novelty. Still. I rush to put my jeans and t-shirt on...no underwear or bra *shudder* Imagine. No. don't. I greet the mailman, finally, and you can see the confusion in his eyes as he had to wait a minute or two with two underwear clad boys and a dog smooshing their faces at the side door window, waiting for me. She's here! I can't wait to try her out! It's coming soon... I can't wait! Does this officially make me a quilter? I wonder? Photos soon...lots going on in life right now, it comes in big waves, and right now we're in a big wave. BIG.